The classic BMW Isetta has been reimagined as an electric bubble car for 2018. 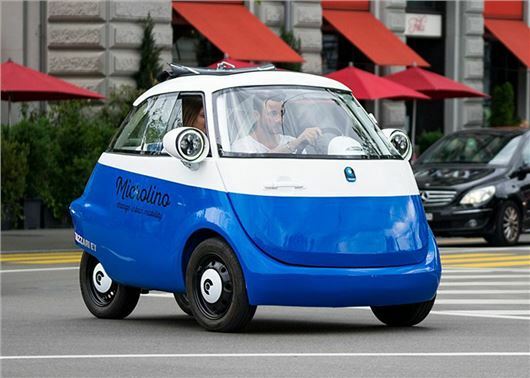 Named the Microlino, the city car is powered by a 15kW motor and has a top speed of 55mph. Prices start in the region of £11,000. Brainchild of Wim Ouboter - founder of Micro Scooters - the Microlino weights just 450kg and takes four hours to charge from a domestic three-pin plug. Drivers get up to 74 miles from a single charge and the two-seater has an advertised top speed of 55mph and a 0-30mph time of five seconds. However, owing to the fact it's classed as a quadricycle, it doesn't have any Euro NCAP crash rating. The Microlino doesn't have any official tie-in with BMW either, but the design is undeniably similar to that of the 1950s' Isetta three-wheel bubble car, right down to the front opening door and circular high set headlights. The two-tone paint schemes also nod towards the German classic. The Microlino isn’t on sale in the UK, but with more than 4500 orders taken in Switzerland and Germany, it’s thought that Britain could be next in line for the electric three-wheeler. At just 2.4 metres long, you can fit almost three Microlinos in the size of an average car parking space, which would give this retro EV lots of appeal for city buyers. It also gets a fabric roof that can be manually opened in the summer, while the in-built heater should provide plenty of warmth in the winter. There's no air con though and the infotainment system is smartphone based, which this means you have to pair your phone via Bluetooth to the in-built speakers and place it on the dashboard holder. Being a scooter specialist, Micro doesn’t have any showrooms or servicing network for the UK. However, the company has announced a partnership with Bosch Car Servicing in Switzerland and it’s thought that a similar arrangement could work here in the UK. Deliveries will start in the summer, with the first cars being delivered to Zurich, followed by Munich. More cities and countries will be added in late-2018. I should think a head on collision is as likely as changing a wheel these days. If you look where you're going you'll never have a head on collision except with the curb or a garage wall. Yes, Yes, Yes. This is what we want, small cars great styling, why has it taken so long especially after the success of the Fiat 500 and the Mini oh and the Smart car? If you say that it is easy to say this after the fact then how about this for a prediction. If anyone made a modern day 60's Lotus Elan, no bigger, no heavier similar stying cues...it would be a huge seller!!!! Please look at the sales of the MX5 which missed the mark dynamically and was a whole size bigger. Tata nano offers a very cheap alternative. Why would some one buy such an expensive battery car.